It was beginning to seem as though it could not be done, and then it happened. Norway’s Therese Johaug did not stand atop the podium after the 10-kilometer classic first stage of the women’s pursuit in Québec City. Sprint champion Stina Nilsson did. Not only that, but the bonus seconds garnered from Nilsson’s win in Friday’s skate sprint allowed her to enter the course for the final leg of the week’s three-race series with a margin that seemed as though it might be insurmountable over her nearest competitors. She started the 10-k freestyle pursuit 33 seconds ahead of Norway’s Ingvild Flugstad Østberg who took eighth in the sprint and third in the 10 k classic, and 49 seconds ahead of Johaug, who took 25th in the sprint and after a double pole battle that she could not win, finished only 0.2 seconds behind Nilsson. When it was her turn, Johaug charged onto the course like a hungry cheetah in pursuit of a Swedish gazelle on the city’s Plains of Abraham. She was simply attacking the course with the unmatched tempo and fire that earned her a perfect record in regular season distance races. On a relatively flat course and hard packed fast conditions, she could not delay her chase; she needed to begin making up time as soon as she pushed through the start gate. At the front, Nilsson skied smoothly, remaining calm and collected despite knowing she was a target for the two skiers in red who were slowly reeling her in. By the 2.4 k checkpoint, Johaug had made up nearly 13 seconds of her deficit. By 5 k, she caught Østberg and remained tucked into her draft as the two continued to gain time on Nilsson. But as the finish line neared, it became clear that the Swede was not going to roll over for the Norwegians. In the final three kilometers, Østberg and Johaug could no longer make up significant ground and remained about 20 seconds behind Nilsson’s graceful and powerful V2. With less than 1k to go, Nilsson crested the hill by the stone Martello gun tower and headed for the stadium. The Norwegians were lurking not far behind as she rounded the corner past the cannon and no pole skated down the hill before climbing over the final roller. But they were quickly running out of real estate in their chase. When she arrived at the stadium, she looked back and smiled. The gazelle was safe. 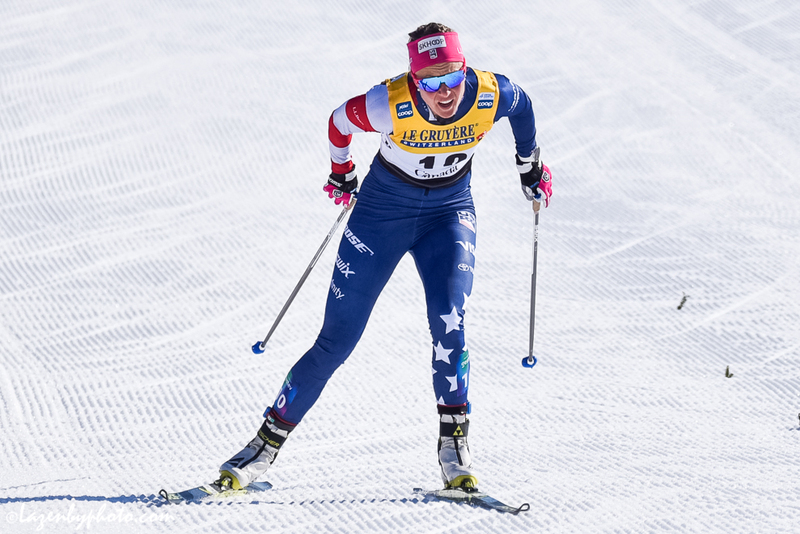 She stood up and gave a wave, then continued to ski with purpose and joy to the hairpin turn before the final 100 meters where she savored her hard earned sweep of the World Cup Final tour. Nilsson looked both relieved and proud as she crossed the line, stopping the clock at 23:55.1. Never laying off the gas, Johaug slid through the finish 12.9 seconds behind, followed by Østberg in third (+15.1). 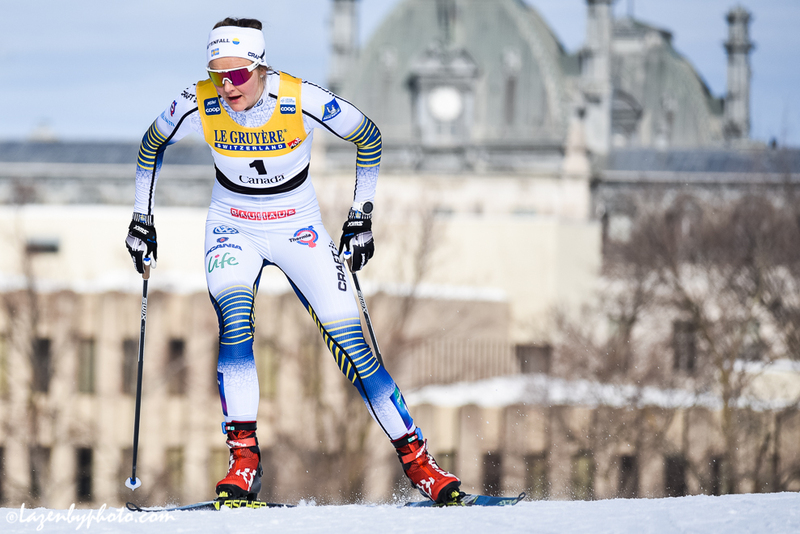 The Swede has been well suited for the track in Québec, and though she was skiing alone, Nilsson never felt that way, as cheering spectators lined the majority of the course. Her clean sweep of the tour was not the first time she has seen success in Canada. She also won the freestyle sprint there in both 2016 and 2017. “Before this weekend, I had two victories here, and now I have five, so I really like Québec,” she laughed. With Russia’s Natalia Nepryaeva far behind in 12th (+1:53.0), Østberg also breathed a sigh of relief as she officially became the overall winner of the World Cup season. She led by only a small margin entering the tour, and as Nepryaeva experienced first hand after a crash and broken pole in the classic stage, anything can happen in the finals. Her younger self might have been in disbelief of this title, as she could not imagine herself at the level of her teammates who became champions before her. Though she did not catch Nilsson, Johaug skied the fastest time of the day, adding to her heavy purse of FIS points. Her second place finish Saturday did not make a dent in the lead she had over the rest of the women in the distance standings; she was essentially in possession of the distance globe before the final tour started. Even without competing in the Tour de Ski, Johaug’s string of nine victories, coupled with her results this weekend amassed 956 points, 139 more than Østberg who took second. She also finished the season ranked third in the overall despite only entering one sprint event on Friday. 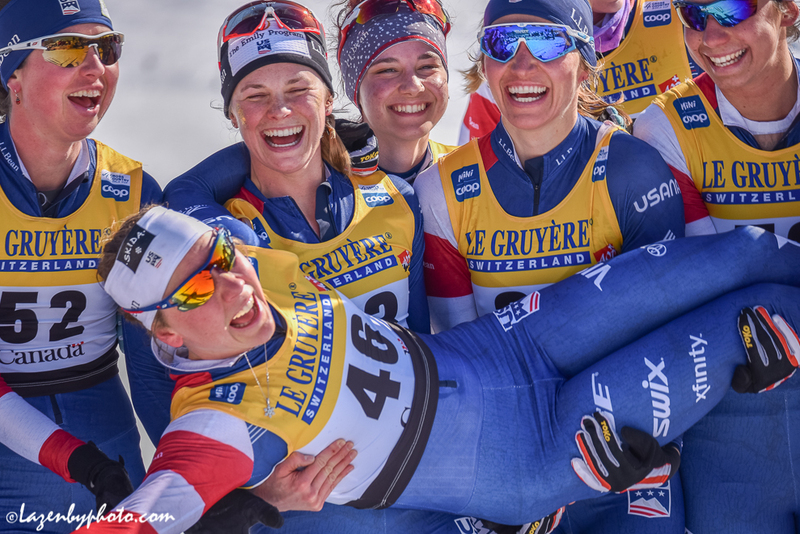 The American women were unable to crack the top 10 in the overall tour standings, but four of them were able to place within the top-30 in the Winner of the Day results. 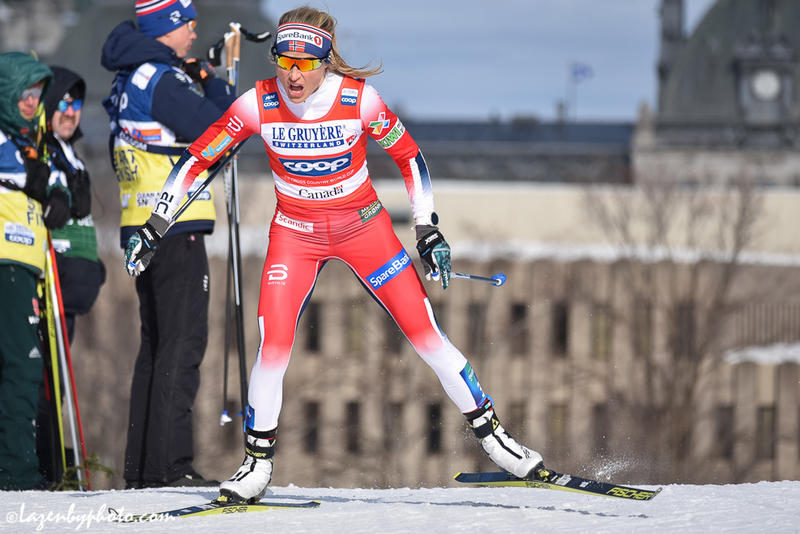 Sadie Bjornsen was the overall top ranked skier finishing 11th (+1:45.4) with the 13th fastest time on the course. With her usual spark and never-give-up positive attitude, Jessie Diggins moved ahead nine places to finish 14th overall (+1:53.6). And it was a good race. Diggins powered through the course to ski the 4th fastest time of the day behind Johaug, Krista Pärmäkoski of Finland, and Ebba Andersson of Sweden. 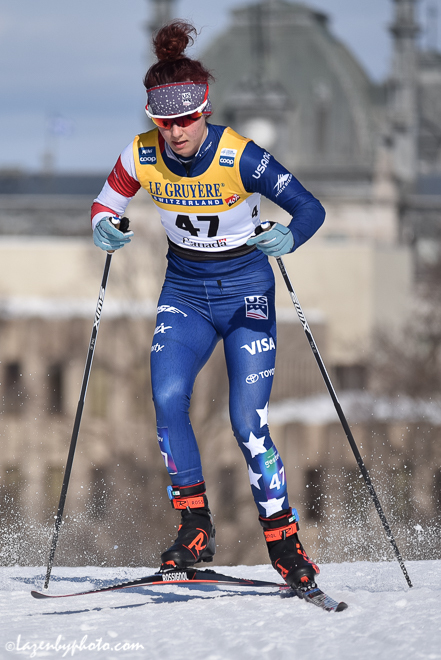 Rosie Brennan moved from 43rd to 39th by skiing the 28th fastest time of day (+4:41.8), and Julia Kern moved ahead seven spots to finish 43rd with the 30th fastest time (+5:23.7). While Brennan had hoped for more from this weekend, she is proud of her race today. 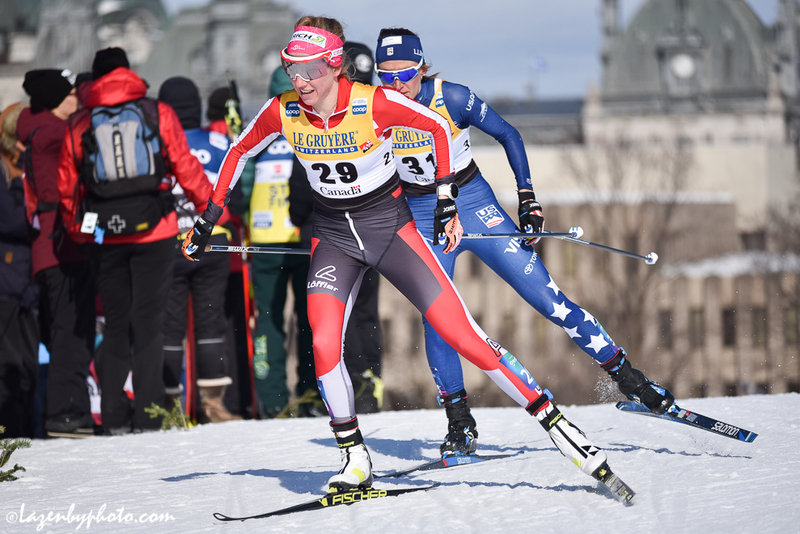 Brennan added insight into the tour format and race conditions during the final series in Quebec. 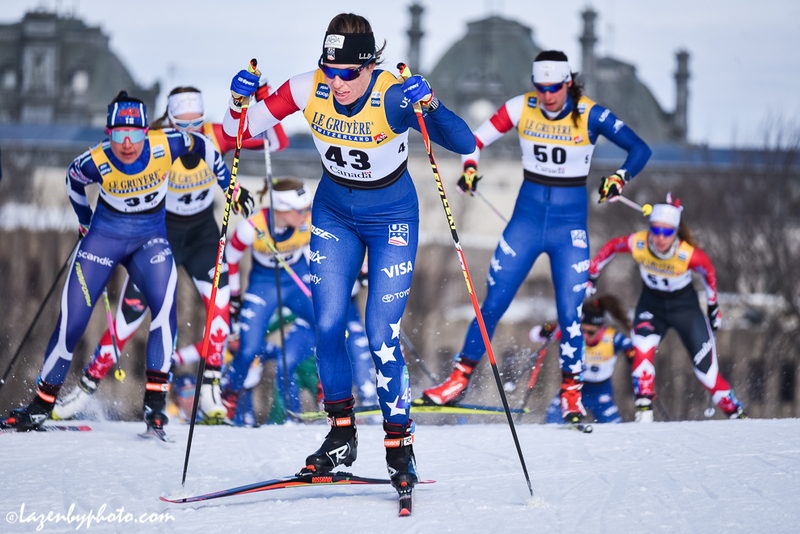 Also for the U.S., Sophie Caldwell finished 36th (+4:05.1), Hailey Swirbul 41st (+5:06.2), Caitlin Patterson 46th (+6:11.4), Katherine Ogden 47th (+6:13.9), Ida Sargent 48th (+6:21.9), Kendall Kramer 51st (+6:31.4), Kaitlynn Miller 52nd (+6:44.7), Hannah Halvorsen 58th (+8:24.3), Becca Rorabaugh 59th (+8:44.1), and Alayna Sonnesyn 68th (+11:02.3). Today’s race will be the last of Sargent’s career. The bio of the 31-year-old Craftsbury Green Racing Project member includes a long list of top 30 finishes from as far back as 2012. She competed in two Olympics, Sochi and PyeongChang, and stood on the podium three times during her career. As her hometown of Barton, VT is only three hours from Québec City, she was able to ski her final race with plenty of family and friends cheering her on. FasterSkier did not hear from Sargent after her finish, but after skiing together for seven years as USST A-Team members, Diggins shared her thoughts on Sargent’s retirement. “She’s had an incredible career,” said Diggins, “but beyond that she’s just a really caring teammate and she’s always down for a laugh. It’s hard to have somebody who, you know… we joined the team at the same time, so we’ve been on the team together the entire time. It’s hard to see someone retire, but I know that she’s going to do amazing things in her next career and I’m just so happy for her that she got this beautiful wonderful day in front of so many home fans to have her last race. What a special experience. And it was fun to spray her with champagne,” she laughed. Since the finals were held in Canada, the U.S. was given the opportunity to enter more athletes in the races. This gave several younger athletes, including 16-year-old Kramer of Fairbanks, AK, the opportunity to experience their first World Cup race. 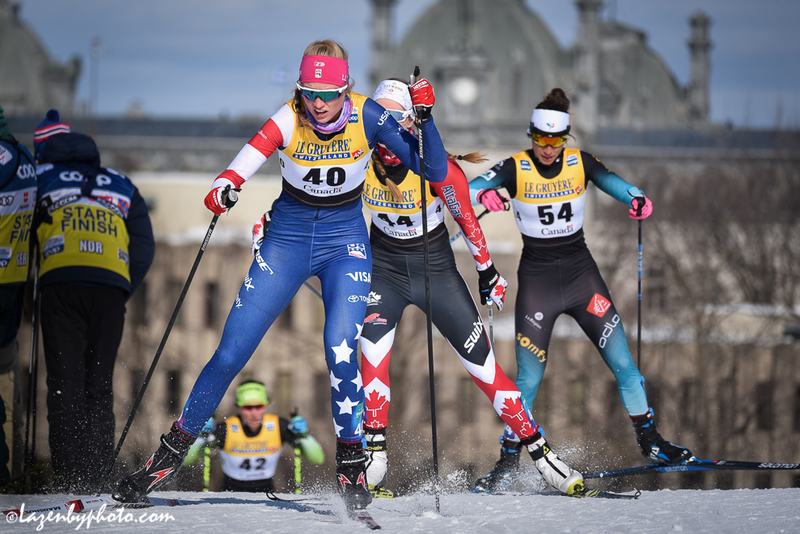 After her first season on the USST D-Team, Swirbul is walking away with a slew of positive results, including a 10th place finish in the 15 k classic at the U23 World Ski Championships in Lahti. Emily Nishikawa was Canada’s top finisher. 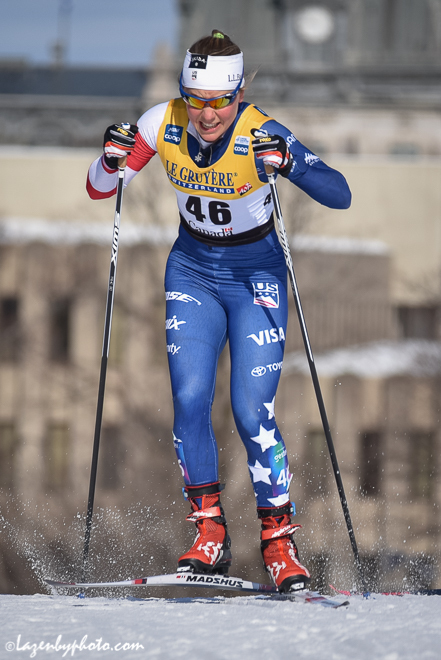 She began as the 37th skier and placed 31st (+3:53.9). The next two fastest were Katherine Stewart-Jones who finished 44th (+5:27.2) followed by Dahria Beatty in 45th (+5:47.7).